Views per Cycle – it is the number of impressions of each ad in set, the weight of which is set to 10. The cycle is considered finished in the case if all connected ads (max weight) were shown this number of times. Ads with less weight will be shown less frequently (weight 10 – 100%, weight 3 – 30%, etc). On the basis of this value is calculated the relative ratio of ad impressions. When the cycle is finished all relative counters reset to 0 and the cycle begins anew. Each reset of cycle requires a separate SQL query. The higher the value, the less additional requests will be fulfilled. However, the larger the value, the greater the probability of occurrence of overflow error (do not set this parameter to the max integer value). Minimum Level for the Menu Access – Who can use menu of the plugin. Minimum User Level needed for access to menu of plugin. 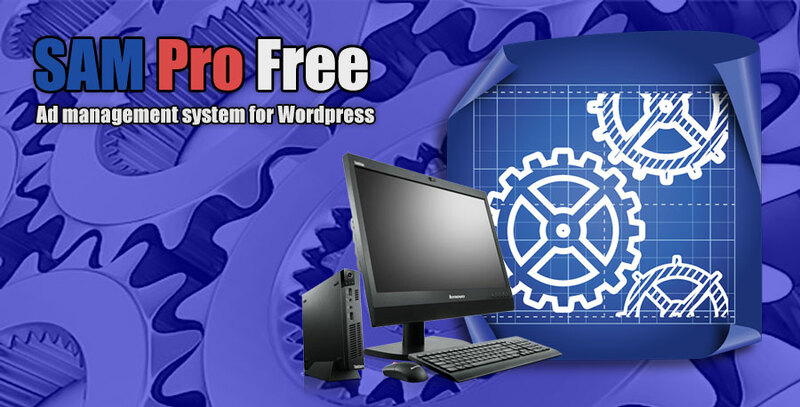 In any case only Super Admin and Administrator can use Settings Menu of SAM Pro Lite Plugin. Display Ad Source in – New Window (Tab) or Current Window (Tab). Target window (tab) for advertisement source. Allow displaying ads on bbPress forum pages – available only if bbPress is installed on your blog. I use (plan to use) my own flash (SWF) banners. In other words, allow loading the script “SWFObject” on the pages of the blog. Turn on/off the error log, Turn on/off the error log for Front Side – If you have any problems or you think that you have any problems, turn on these options. All the problems associated with MySQL will be recorded in the error log. Items per Page – How many rows of the items list will be shown on one page of the data grid. Just turn on the necessary rules. The more rules you use – the greater the length of the SQL request will be generated. Turn on only those rules that are going to use. Only those rules that you have turned on here will be available for use on the page of Advertisements Editor. If you want to sell advertising space, be sure to turn on the schedule rule. Clean Uninstallation – garbage collection in the process of deactivating the plugin. Delete plugin options during deactivating plugin – all plugin’s options will be removed from WordPress options table. Delete database tables of plugin during deactivating plugin – all plugin’s DB tables will be removed from your database. Delete custom images folder of plugin during deactivating plugin – plugin’s images folder will be removed from your server. ALE – ads linking and embedding. SAM Pro Plugin can automatically insert the Ad Objects into the content of posts and pages. Here you can configure all the options of this possibility. 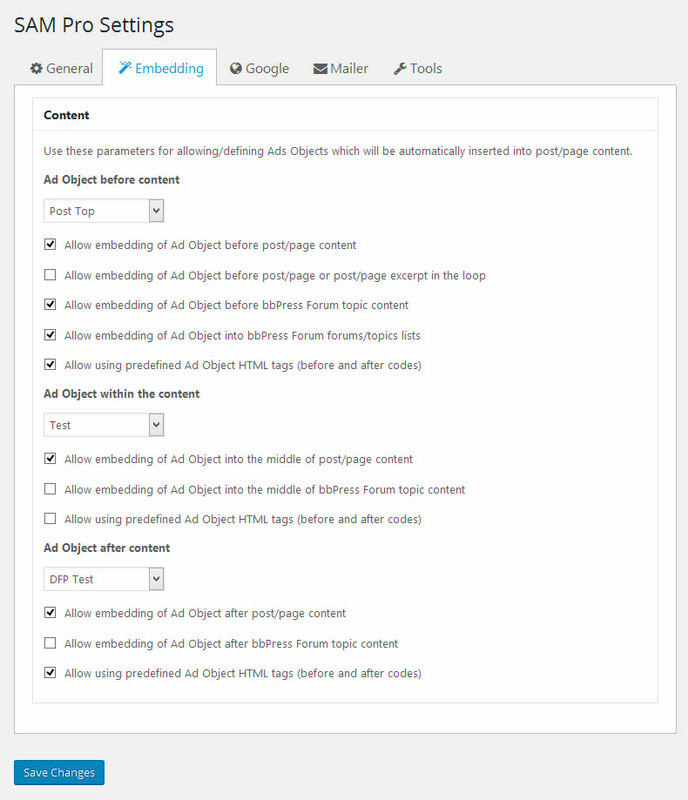 In this section you can allow embedding of Ad Objects only on pages and pages of single posts. Ad Object before content – select an Ad Object you want to display before the content of single post or page. You can: Allow embedding of Ad Object before post/page content, Allow embedding of Ad Object before post/page or post/page excerpt in the loop, Allow embedding of Ad Object before bbPress Forum topic content, Allow embedding of Ad Object into bbPress Forum forums/topics lists. If you want to use predefined HTML tags check “Allow using predefined Ad Object HTML tags (before and after codes)” checkbox. Ad Object within the content – select an Ad Object you want to display within the content of single post or page. Ad Object after content – select an Ad Object you want to display after the content of single post or page. You can: Allow embedding of Ad Object after post/page content, Allow embedding of Ad Object after bbPress Forum topic content. Here you can adjust parameters of your Google DFP account. If you plan to use Google DFP on your site you must Allow using Google DoubleClick for Publishers (DFP) rotator codes. It means that you allow loading Google JS scripts in the header of your blog. Google DFP Mode – select mode of Google DFP: GAM (Google Ad Manager) or GPT (Google Publisher Tag). Google DFP Pub Code (GAM) – Your Google DFP Pub code. i.e: ca-pub-0000000000000000. Only for GAM mode. 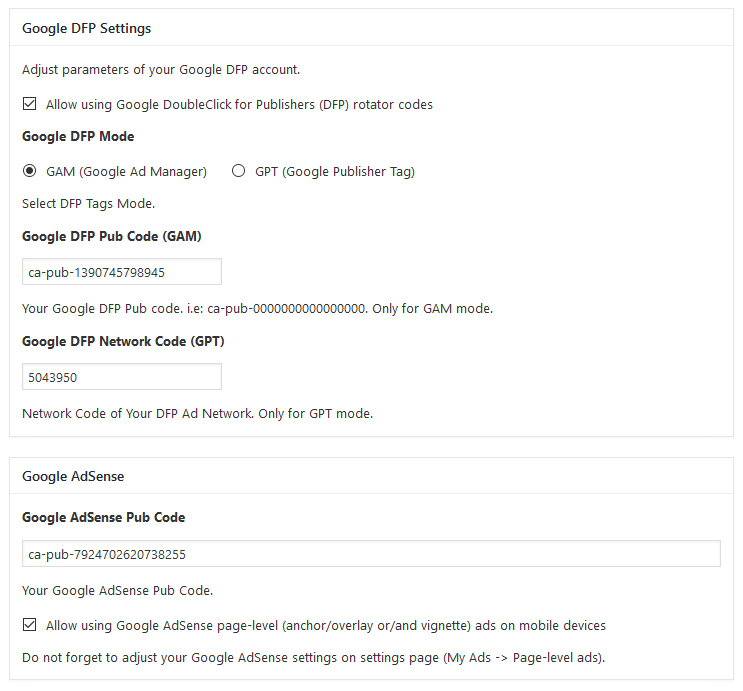 Google DFP Network Code (GPT) – Network Code of Your DFP Ad Network. Only for GPT mode. You can enable Google AdSense page-level ads for mobile devices using only your AdSense publisher ID. Mobile ads that stick to the edge of the user’s screen and are easily dismissable. Mobile full-screen ads that appear between page loads on your site and can be easily dismissed by your users. Google AdSense Pub Code – your Google AdSense Publisher ID. Use prefix “ca-“, ie: ca-pub-0000000000000000. Allow using Google AdSense page-level (anchor/overlay or/and vignette) ads on mobile devices – just check this checkbox for allowing… Do not forget to adjust your Google AdSense settings on settings page (My Ads -> Page-level ads). You can Allow SAM Mailing System to send statistical data to advertisers with Periodicity of sending reports. Available periodicity: monthly or weekly. [name] – will be replaced with the advertiser’s name. [site] – will be replaced with the name of your site. [month] – will be replaced with the name of the month of the reporting period. [year] – will be replaced with the year of the reporting period. [first] – will be replaced with the first date of the reporting period. [last] – will be replaced with the last date of the reporting period. Mail Subject – Mail subject of sending email. Mail Greeting String – Greeting string of sending email. Mail Text before statistical data table – Some text before statistical data table of sending email. Mail Text after statistical data table – Some text after statistical data table of sending email. Mail Warning 1 – This text will be placed at the end of sending email. By default: “You received this mail because you are an advertiser of site [site]. If time of your campaign expires or if you refuse to post your ads on our site, you will be excluded from the mailing list automatically. Thank you for your cooperation.”. Mail Warning 2 – This text will be placed at the very end of sending email. By default: “Do not respond to this mail! This mail was sent automatically by WordPress plugin SAM Pro Lite.”. You can allow detection of Bots and Crawlers. In this case you must define Accuracy of Bots and Crawlers Detection. Inexact detection – Bot or crawler detected by circumstantial evidence. Chances of errors in case if visitor came through anonymizer. Exact detection – Bot or crawler is detected by a partial analysis of the signature. More exact detection – Bot or crawler is detected by a full analysis of the signature. Not recommended. The level of the problem does not match the level of resources spent. If bot is detected the hits of ads won’t be counted. Use with caution! More exact detection requires more server resources. You can allow to collect and keep statistical data. Keep Statistical Data – Period of keeping statistical data (excluding current month). Display of Currency – Define display of currency. 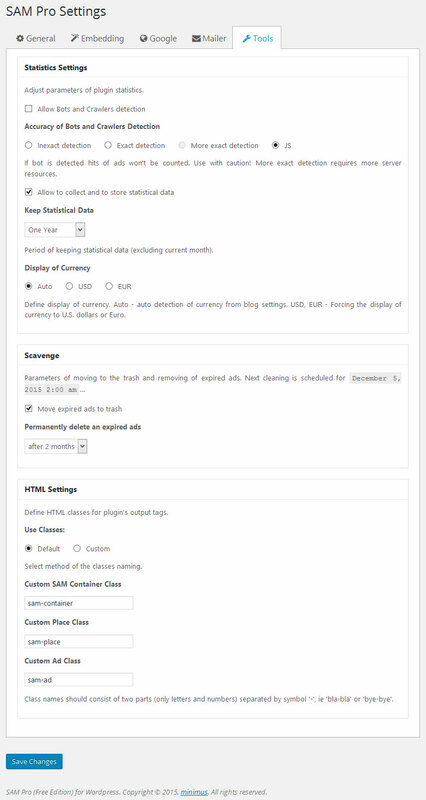 Auto – auto detection of currency from blog settings. USD, EUR – Forcing the display of currency to U.S. dollars or Euro. Parameters of moving to the trash and removing of expired ads. Permanently delete an expired ads – sets the time period after which it is necessary to remove the expired ads. You can define HTML classes for plugin’s output tags. Use Classes – Select method (default or custom) of the classes naming. Custom SAM Container Class, Custom Place Class, Custom Ad Class – set custom names of classes for output tags. To prevent Ad Blocker detecting and blocking your ads use custom classes. I want to use SAM Pro Free with DFP. When I generate tags in DFP, it generates code for the <head> as well as <body> part of the page. How do I get those googletag.defineSlot lines in the header?